The interiors are decorated with frescoes by Benedetto Borzone, Camillo Pucci and Francesco Gandolfi and feature important masterpieces by Anton Maria Maragliano. Built in 1630 by the architect Bartolomeo Bianco, it was enlarged during 18th century by the Grimaldi Family, new owner of the palace. 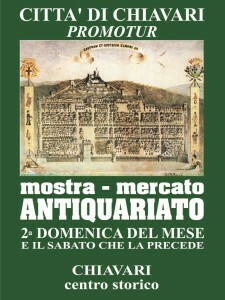 Since 1912 it is property of the Municipality of Chiavari that recently restored it together with the near botanic park. Inside the Rocca Palace it is possible to visit an Archaeological Museum, inaugurated in 1985, that houses the evidences of the pre-Roman local necropolis; an Historical Museum dedicated to the Risorgimento period; an Art Gallery with important Genoese masterpieces from 16th to 18th centuries. Probably founded between 13th and 14th century the Sanctuary is well-known for its important frescoes: in the apse and on the side walls it features the Bible Stories by Teramo Piaggio while on the entire counter-façade it is possible to admire a Last Judgement by a young Luca Cambiaso, clearly influenced by Michelangelo’s same subject of Sistine Chapel in Rome. The building, the former seat of the Chiavari Courthouse, is located in Giuseppe Mazzini Square, in the middle of the city’s historical centre. Designed by Giuseppe Partini and built in 1886, the Medieval style building contains elements inspired by Tuscan Gothic style. In this spot once stood the old 15th century Citadel built by the Republic of Genoa, at the time its civilian and military power was concentrated here. The battlemented tower, dating back to 1537, still stands at the centre of the building.